Showing results for tags 'leicaq'. I have been editing some images from a recent trip and discovered that my raw files seem weirdly damaged but the Jpegs seem fine. I have attached screen shots of the same image files both dng and jpeg. They are from different SD cards which haven't been formatted since i downloaded them. I also copied them straight over from a relatively new card reader and not through any software It has occurred on a lot of files but not all of them, or maybe its not as noticeable on some files. The images are taken on different ISO's from 100 - 2000 and also in both low light and daylight, i haven't added the daylight examples as its not as noticeable so just adding the better examples. I'm using photomechanic to view them and these are just a portion of the image are these recoverable / ruined..? does anyone know what has happened..? The arriving of the bride at the church is probably one of the most anticipated moments for a bridegroom in his wedding day. Now let me dedicate this shot to those forum members who already lived such a moment but also to those of you who have not but are considering the plunge;-) Leica Q.
Hi. Just thought I would share this on screen protectors for the Q. I don't know about you but I have never been happy with Leica one. It's hard to get installed, shows mares easily and really effects the clarity of the screen. In searching for something better, I came across the Phantom Glass ones. Only one problem, they didn't list one for the Q. So with the help of the "camerasize.com" web site I compared the screen sizes of all the cameras Phantom Glass did have glass protectors for against the Q and found one that appeared to be the right size. It's the one of the Fujifilm X-100t. Not being sure, I attempted to contact Phantom Glass with an inquiry as to the actual size but never heard back. I decided to take a shot and ordered the Fujifirm X-100t glass screen protector. I'm happy to say the it fits great, just a millimeter smaller in each direction. It's crystal clear and the touch screen works fine. If you were like Me, you might want to check out the Phantom Glass screen protectors. I've included a picture of the Q with the protector install, forgive the glare, that was the best shot I got showing how the protector fits. After a couple of weeks of playing and learning the camera I start to getting used to the Appenture or Shutter priority ... And this works really well for me. Is the next logical step mastering Manual Mode? What is the best practice? When do you use it? on what occasion? What is your experience? Not received my Q yet, but have (perhaps stupidly) already picked up my required accessories, including an extra two official Leica BP DC12 batteries. I was wondering if anyone who already had a Q were already using a third party battery? I was considering from a reputable brand like Duracell (the DRPBLC12). I'm not very concerned about the lower capacity (950 mAh vs 1200), but I am concerned about a third party battery not showing how much power is left via the LCD, which I think is par for the course nowadays. Thoughts or experiences? I'm pleased I took along the Leica Q to yesterday's pre-wedding shoot. Very strong backlight, but the EVF is amazing and allowed me to see exactly what I was getting. Missing the Decisive Moment 1932, Paris, near the Gare Saint-Lazare the great Henri Cariter Bresson approaches a flooded construction site enclosed by an iron fence. He quickly realizes the potential of the situation and as a man dressed in black leaps over the ladder lying on the ground trying to avoid getting his feet wet, he presses the shutter just a fraction of a second before the heel of the man’s right shoe hits the water. He just made what was arguably going to be his most iconic street photograph ever. If, instead of using one of his beloved mechanical Leicas, he had used a Leica Q, looking though its fantastic EVF, he would immediately have avoided the parallax issue that caused him to include a part of the fence through which he was photographing and which forced him to apply a slight crop. The last glimpse he would see in the viewfinder was in fact the much desired decisive moment, but what he would find when hitting the PLAY button would be a picture with a big splash of the man landing in the puddle of water. Not because his reflexes were not quick enough, not because of any delay in the class-leading shutter of the “Q”, but because of a more serious quirk of the Leica Q which under certain circumstances makes it almost useless as a tool for capturing the “decisive moment”. It turns out that under certain circumstances the delay with which the real world is presented through the EVF (or the LCD on the back of the camera) makes it almost impossible to catch the right moment. By the time you see something happening in the viewfinder the world has moved on and what you get in the final picture is not what you had expected. Try this: set your camera for a typical daylight street scene on a sunny day using the “sunny sixteen” method (F16, Shutter = 1/ISO), so for example F16, 1/500th, ISO 500. Now watch someone walking while half-pressing the shutter and then press through completely just as the subjects front foot is just about to hit the ground (as in HCB’s picture). What you get is a rather unpleasant front leg with a bent knee. If you repeat the exercise looking at your subject directly (ie, not through the viewfinder) you should be able to get exactly the moment you want. To be more explicit, and in order for anybody to easily repeat the experiment, I’ve used a metronome app running on an iPAD as a continuously moving subject. In the following video I’ve set the speed of the metronome to 248 bpm running on an iPad set at maximum luminosity. 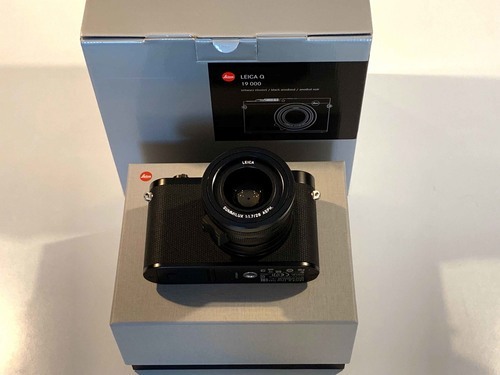 The Leica Q is set to F16, 1/125th, ISO 50000 and the rear LCD screen and the iPad are recorded with an iPhone 6. I apologize for the quality of the video, but I think it is absolutely clear that when the shutter is half-pressed (which closes down the diaphragm) the delay becomes immediately visible. Also notice that if the shutter is not half-pressed there is no delay. In theory, therefore, it would be possible to follow the action without half-pressing and then doing a full press at the right time, but often you want to half-press to make sure all of the normal chores of autofocus, metering etc. are taken care of so as not to waste further time. The problem seems to be intimately related to the F-stop, the higher the F the worse. At F below 4-5.6 it is hardly noticeable. https://youtu.be/EPTyJrfnkgs In this second video I’m showing a Fuji X100T in the same conditions and as you can see there is no noticeable delay. Also the Fuji X-T1 is without delay in the same conditions, which leads me to believe the problem to be specific to the “Q”. https://youtu.be/8GoNQXW0Ke0 I hope the design engineers of Leica get a chance to read this post and perhaps to repeat these experiments for themselves in the hope that they may come up with a solution in a future firmware update. On a side note I wonder if the new SL has the same problems. Since it is marketed as an action camera I think it would be a real deal breaker if it did. Aside from the problem described I would like to express my full appreciation of the camera. For reportage/street photography with its excellent intuitive handling, super silent shutter, unquestionable image quality, buttery smooth manual focus, lightning fast autofocus and general unobtrusiveness the Leica Q is really hard to beat.